Chickpeas (pois chiches in French or hummus in Arabic) are a popular legume in Moroccan cooking. In this recipe, dried chickpeas are soaked, peeled and then cooked until tender with onion, saffron, salt and pepper. The beans are then pureed and the resulting mixture can be served as a dip or thinned to soup-like consistency. Drizzle with olive oil, or add a small dab of butter and a tiny pinch of cayenne as garnish. Allow eight hours or overnight soaking for the chickpeas. For a fat free preparation, the olive oil may be omitted, but be aware that it does lend some flavor and a smoother consistency to the pureed serrouda. Note that the name serrouda may also refer to a salad of chickpeas in tomato sauce. Also try Bessara, a dried fava bean puree which can also be served as a dip or soup. Ahead of time, place the dried chickpeas in a large bowl and fill with tap water. Leave the chickpeas to soak overnight or for at least eight hours. Proceed to the next step, or freeze the chickpeas until needed. Place the soaked, peeled chickpeas in a 3-quart pot along with the onion, oil and spices. Cover, reduce the heat, and simmer the chickpeas for about 1 1/2 hours, or until tender. Pass the chickpeas and their liquid through a food mill, or puree everything in a food processor until smooth. Add additional water as needed to yield either a dip which is thin enough to pour, or a thick, pureed soup. 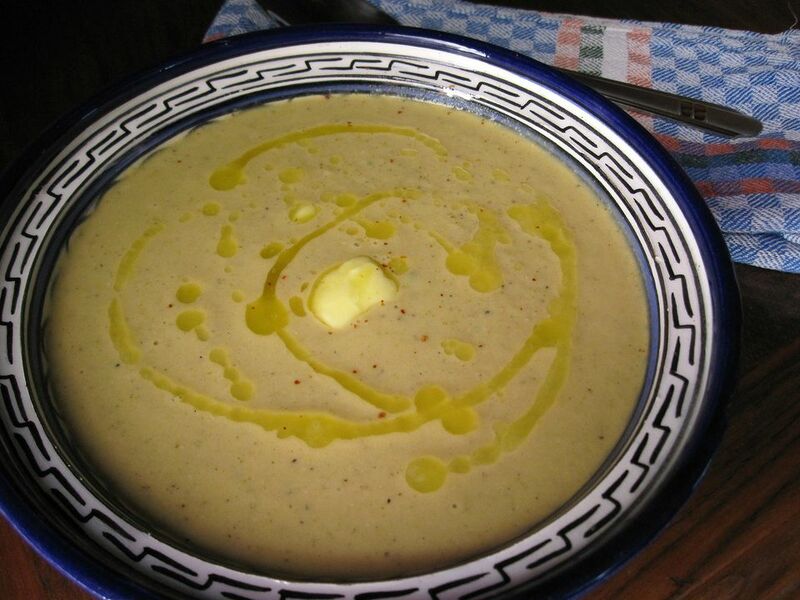 Serve the serrouda warm as a soup, dip, side or light dinner with bread for dipping. If desired, garnish the chickpea puree with olive oil or butter and a light dusting of cayenne pepper or paprika. Cumin may also be added as seasoning.